History swirled around the rare booking of MC50 at the 930 Club Tuesday. Yes, it was the half century anniversary of the debut LP of the Motor City Five. In addition, a couple of weeks earlier had marked 50 years since the Democratic National Convention police riots in Chicago, where the MC5 served as house band amid the tear gas of Grant Park. And here they were in Washington, on the anniversary of 9/11. Anyone expecting the lone survivor of the band to come out doddering had another thing coming. Guitarist Wayne Kramer was, if anything, at 70, the most active person in the reconstituted band, swirling and kicking his way onto the set and continuing his high energy approach to what looked to be the same stars and stripes guitar he used back in the day. He also grinned ear to ear during most of the show, as did the younger rockers surrounding him in playing the band’s classics. Chief among them was guitarist Kim Thayil of Soundgarden, touring for the first time since the death of Chris Cornell in May 2017. He largely provided solid rhythm while leaving Kramer to do his explosive originating solos. But there were several times when the two combined forces to trade off solos as on “Rocket Reducer No. 62 (Rama Lama Fa Fa Fa)” and “Borderline.” Mostly it was good to see him back in action on stage. Billy Gould of Faith No More held down the bass, and the biggest roar all might may have been for hometown hero Brendan Canty of Fugazi on drums, slamming it out all night. But they found something special in 6-foot-7 front man Marcus Durant of the San Francisco band Zen Guerrilla, who seems to have reincarnated the very spirit of Rob Tyner, from the wild Afro to the lanky loose-jointed moves and especially the blues-tinged yowl. Those who know the band chiefly through that hard rock clarion call may miss the full spectrum of the band’s interests, from 1950s-inspired rock ’n’ roll to gritty Fabulous Flames funk and soul, to the experimental Sun Ra-style tangents on tracks like “Starship” (so named way before Jefferson Airplane took a nosedive to that moniker). The performance of “Starship” had Durant give up his harmonica for a weird blown instrument, like half a trumpet, or a wayward flute, or a piece of metal tubing that may have been laying around, ready to assist in making free jazz. For all the political charge with which the band has been infused (such is the case when the American flag is your first iconic backdrop), Kramer paused only briefly to comment on today’s woes, and its epicenter not far from the storied D.C. club. Instead of leading a march down to Pennsylvania Avenue, though, he provided the prematurely cynical “The American Ruse” and the concluding “Looking at You” (as in: looking at you to change things, audience). 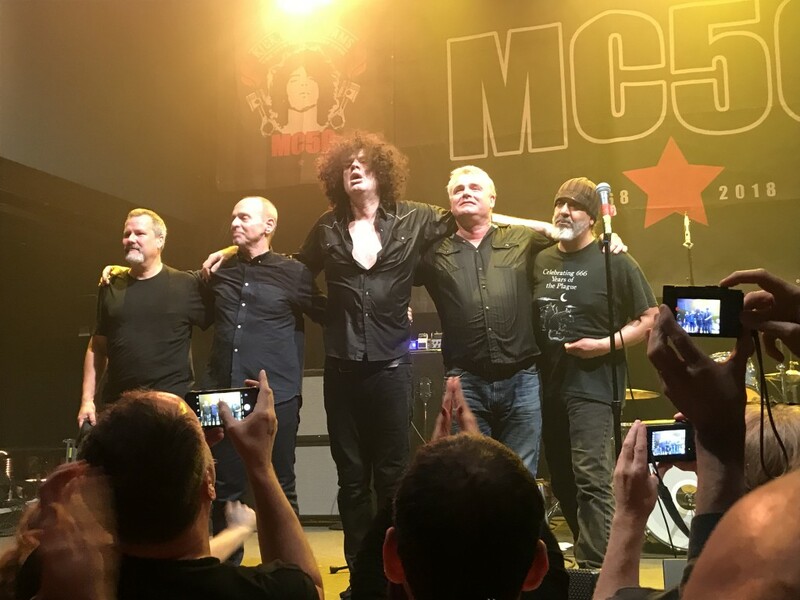 In addition to the name rockers filling out the touring band, MC50 has been including guest stars all along its tour stops. In Washington, it was bearded Valient Himself (once known as Herbie Abernathy) of the South Carolina hard rockers Violent Thorr, who not only introduced the band the way John Sinclair did on the MC5 debut LP, but returned to help out on the garage rock classic “I Can Only Give You Everything,” the Them song which the 5 covered in an early single in 1967. The succinct show had the power of a punch, not one drenched in nostalgia but like some pipe dream of the past but arising to inspire anew in a century that needs it. For fans of Motor City rock, it was a double pleasure, with the opening set from the Detroit Cobras. The ace rockers led by singer Rachel Nagy and guitarist Mary Ramirez front a revolving group of musicians rounding out the quintet that plans nothing but covers of tasty and often obscure ’60s singles. Nagy has a voice like Ronnie Spector, supercharged with the chords of a no-nonsense band for an effect meant to be in your face and make you dance. Even if they slowed once for a ballad, to sing Irma Thomas’ “Cry On,” they were back to high energy stompers like “Shout Bama Lama,” the Otis Redding rocker, before you knew it. Nagy seemed uncomfortable wearing some of Ramirez’ clothes since her own suitcase never arrived, but like the rest of the band, anchored by dynamic drummer Kenny Tudrick, she was excited to see the headliners, and stayed on the side of the stage for the whole of the show so the Cobras could rock out to MC50 like everybody else.